Since the introduction of the corn stalk nitrate test (CSNT) as an end-of-season evaluation tool for nitrogen (N) management in 2nd or higher year corn fields, the number of fields that have been tested for CSNT has been on the increase. The greatest benefit of this test is that it allows evaluation and fine-tuning of N management for each specific field. It does, however, require multiple years of testing to gain experience with on-farm interpretation. Corn stalk nitrate test results >2000 ppm indicate there was significantly more N available during the growing season than the crop needed. The summary of CSNT results for the past eight years is shown in Table 1. In the 2013 and 2014 growing season, the CSNT testing results from the Nutrient Management Spear Program and Dairy One were summarized to obtain a distribution of CSNT categories in New York State. Quality control samples shared between the two laboratories in both years showed excellent consistency in reported data between the two laboratories. Data prior to 2013 reflect submissions to Cornell University only. For 2014, this summary shows that about 36% of all tested fields were over the 2000 ppm range, while 27% were over 3000 ppm and 14% exceeded 5000 ppm. In contrast, 29% of the 2014 samples tested low in CSNT. For 2nd or higher year corn fields, low test results (less than 250 ppm) are likely to reflect a true N deficiency. Weed pressure, disease pressure, lack of moisture, lack of oxygen and other stress factors can impact the N status of the crop, so in some circumstances, additional N might not have been able to overcome the real reason for the low CSNTs (e.g. no amount of N fertilizer can make up for a drought). As mentioned, the CSNT is most effective when used for multiple years on the same fields to determine how each responds to the way N is being managed. Crop history, manure history, other N inputs, soil type, and growing conditions all impact CSNT results, and crop management records that include these pieces of information can be used to evaluate CSNT results and determine where changes can be made. 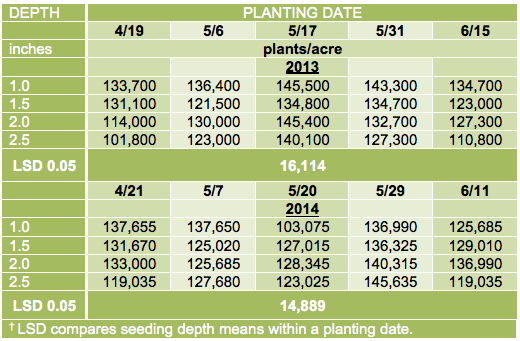 Does Soybean Planting Depth And Planting Date Matter That Much In New York? The number of herbicide resistant weed biotypes has increased from 404 to 437 in the past 12 months. 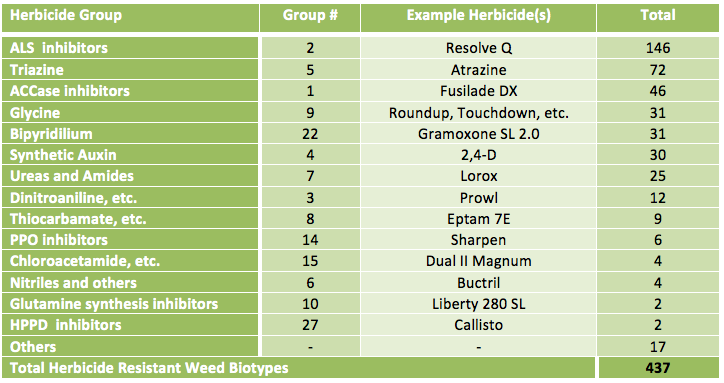 A summary of resistant biotypes for various herbicide site-of-action groups is shown in Table 1. There have been 13 new cases of ALS (acetolactate synthase) inhibitor resistance (Group 2 herbicides) and 7 new cases of glyphosate (EPSP inhibitor) resistance (Group 9 herbicides) around the World during the past year. Along with these newly documented cases of herbicide resistance, there continues to be much media attention to this problem, especially related to glyphosate-resistant (GR) weeds. In response to the growing concern about herbicide resistance, the Weed Science Society of America (WSSA) sponsored a national scientific summit on this topic September 10, 2014 in Washington D.C. This summit built on the insights and perspectives developed at a similar event in 2012. Dr. David Shaw, a past president of WSSA and Chair of the WSSA Herbicide Resistance Education Committee said “We want everyone to walk away with a clear understanding of specific actions they can take to help minimize the devastating impact of herbicide resistance on agricultural productivity”. In Addition, WSSA issued a new fact sheet to address the media attention/hysteria about herbicide resistance on October 8, 2014. 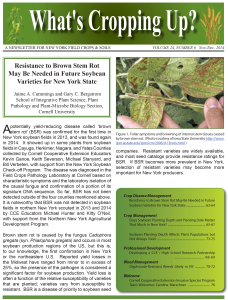 The fact sheet discusses the truth behind two common misconceptions about “superweeds”. According to WSSA, the first misconception is that “superweeds” are the product of rampant gene transfer from genetically modified crops creating herbicide resistant weeds. The second misconception is that “superweeds” have supercharged abilities to muscle out competing plants in new and more aggressive ways”. The WSSA fact sheet is posted online at http://wssa.net/weed/wssa-fact-sheets. 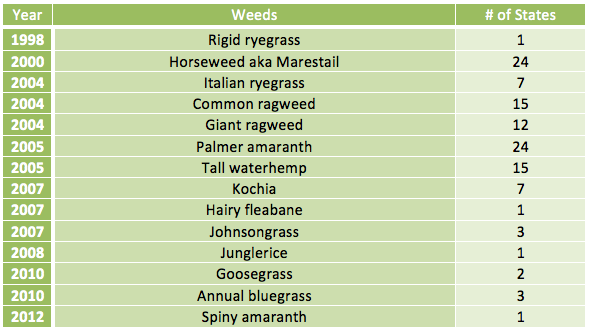 While ALS inhibitor-resistant weeds account for one-third of the documented cases, GR weeds get more attention because of the connection to the vast acreages of GR crops and because of the rapid spread of GR Palmer amaranth across the U.S. A summary of GR weeds in the U.S. is shown in Table 2. Table 2. Documented cases of glyphosate resistance in the U.S. as of December 1, 2014. Although there are no documented cases of GR weeds in NY, it’s likely that there are isolated GR weed populations in the state. Several years ago, there was a situation in western NY where a grower noticed giant ragweed that had not been controlled with a normal glyphosate application in soybeans on newly purchased land. The previous landowner had purchased a combine from Ohio where there have been documented cases of GR giant ragweed. Seed from the surviving giant ragweed were grown in the greenhouse and treated at 3 or 6 inches in height with from 22 to 88 fl oz/A of Roundup PowerMax. Some of the 3- and 6-inch giant ragweed survived up to 88 fl oz/A of Roundup PowerMax. There are also reports of horseweed (marestail) that is not controlled with normal glyphosate applications, usually in zone/no-tillage fields. 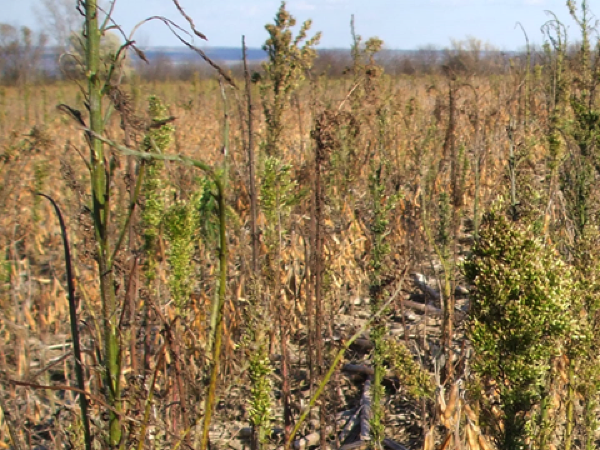 See the accompanying photo of a no-tillage soybean field that shows surviving horseweed plants following burndown and postemergence applications of glyphosate. Figure 1. Horseweed that survived burndown and postemergence applications of glyphosate in no-tillage soybeans. Several Midwest states believe that GR Palmer amaranth was introduced on contaminated cotton seed imported for dairy rations. This was cause for alarm last summer when an astute crop advisor noticed an unfamiliar pigweed that was not controlled with a normal glyphosate application in Wayne County. According to Anna Stalter, Associate Curator and Extension Botanist of the L. H. Bailey Hortorium Herbarium, Palmer amaranth (Amaranthus palmeri) is not native in NY. However, there are two Palmer amaranth specimens from NY in the herbarium collection. One was from Corona on Long Island in 1936 and the other from Albany in 1949. It is believed that the strange pigweed was tall waterhemp (Amaranthus tuberculatus). Stalter says that tall waterhemp is considered native throughout NY, having spread from the Midwest. There are 17 specimens of tall waterhemp from NY in the herbarium collection dating from 1891 near Fort Ann in Washington County to 2005 near DeKalb in St Lawrence County. None are from west of Cayuga and Tompkins. Ten of the Wayne County tall waterhemp plants were sprayed with a normal rate of glyphosate when they were 12 inches tall and actively growing. Nine of these plants died, but one survived, making one believe there may be GR tall waterhemp plants in this population. 1) Crop rotation and the use of hybrids/varieties with different genetic traits for herbicide resistance. 2) Cultivation of row crops to control escaped weeds. 3) Rotate or use herbicides with different sites-of-action over the course of the crop rotation. 4) Use tank mixes/premixes or sequential herbicide applications with different sites-of-action. 5) Scout fields to identify weeds that survive herbicide application and then determine why. Chemical and seed companies, which are often one and the same, provide information and products that reinforce management practices for those who are on the front lines in this battle. Among these are: 1) including site-of-action group numbers on all herbicide containers, 2) developing and marketing premixes of herbicides with different sites-of-action, and 3) developing and marketing crops with multiple types of herbicide resistance/tolerance. It is this last item that is receiving much attention in this battle against herbicide resistant weeds. There are examples of crops with multiple types of herbicide resistance in the marketplace. Most everyone is familiar with SmartStax corn hybrids with resistance to glyphosate (Roundup etc.) and glufosinate (Liberty 280 SL) as well genetic traits for resistance to insects. In addition, there are recently deregulated herbicide resistant crops with new combinations of herbicide resistance/tolerance traits and others under development. 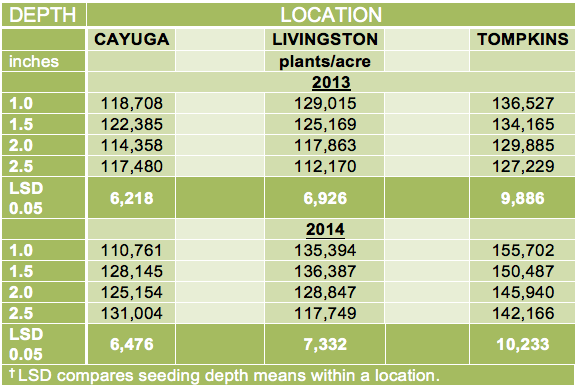 Comments Off on Does Soybean Planting Depth And Planting Date Matter That Much In New York? It is generally recognized that the optimum soybean planting date range in NY is from ~May 10-May 25 and the optimum seeding depth is ~1.5 inches on most planting dates. Some growers, however, have had success by planting soybeans in late April, before planting the corn crop. In addition, a late April or early May soybean planting date greatly improves the probability of timely wheat planting, if soybean growers are in a corn-soybean-wheat rotation. We conducted small-plot research at the Aurora Research Farm in 2013 and 2014 to answer three questions concerning soybean planting: 1) Can soybean be safely planted in late April in the Finger Lakes region and western NY (regions where there is typically no frost after May 15) without a yield penalty, 2) does the 1.5-inch seeding depth fit all planting dates, and 3) should a Group II or Group I variety be selected, if the planting date is delayed until mid-June. We planted a mid-Group II (AG2431) and a late Group I (AG1832) variety on April 19, May 6, May 17, June 1 and June 15 in 2013 and on April 21, May 7, May 20, May 29, and June 11 in 2014 at 1.0, 1.5, 2.0, and 2.5 inch seeding depths at the Aurora Research Farm in Cayuga County. Soybeans were planted in 15-inch rows with a White row crop planter at ~170,000 seeds/acre. We evaluated early plant establishment at ~1st -2nd trifoliate stage (~V2-V3) about 10 to 35 days after planting, depending upon planting date. Each planting date x variety x seeding depth plot was harvested when moistures were less than 16% (September 27, October 3, and October 15 in 2013; and September 29 and October 13 in 2014.). Growing conditions were mostly similar across years, with 2013 somewhat warmer and wetter, but drought stress did not occur in either year (Table 1). Table 1. Monthly precipitation and average monthly temperatures at the Aurora Research Farm in Cayuga Co., NY during the 2013 and 2014 growing seasons. Early plant populations had a significant year x planting date x seeding depth interaction (P=0.09), indicating that the optimum seeding depth varied across planting dates within years (Table 2). In 2013, the 1-inch seeding depth consistently had the highest early plant populations at ~135,000-145,000 plants/acre (~80-85% early plant establishment) for all planting dates. In 2014, however, the 1.0 inch seeding depth had early plant populations of only ~103,000 plants/acre on the May 20 planting date (~60% establishment) because of an extended dry period after this planting date. Likewise, the 2.5 inch seeding depth at the late April planting date had the lowest early plant populations in 2013 (~102,000 plants/acre or ~60% establishment) and in 2014 (~119,000 plants/acre or ~75% establishment), associated with the cool conditions after planting, but mostly similar early plant populations on all May planting dates. The 2.5 inch depth also had the lowest early plant populations on the June planting dates (~111,000 plants/acre or ~65% establishment in 2013 and ~119,000 plants/acre or ~70% establishment in 2014) probably because heavy rains after planting resulted in significant soil crusting before emergence on those dates. Table 2. Plant populations of soybean at ~the 1st trifoliate leaf stage (~V2)) at five planting dates and four seeding depths, when averaged across two varieties (AG1832 and AG2431), in the 2013 and 2014 growing seasons. Seed yield did have a year x planting date x seeding depth interaction, but mostly because of the mid-June planting dates (Table 3). Seed yields did not vary with planting depth across the first four planting dates in either year, despite early plant populations of only 101,800 plants/acre at the 2.5 inch seeding depth on the April 19 planting date in 2013 and of only 103,075 plants/acre at the 1.0 inch seeding depth on May 20 in 2014. Seed yields, however, were lower on the June planting dates at the 2.5 inch depth in 2013 and 2014 (~20% in 2013 and ~8% in 2014) and at the 1.0 inch depth in 2014 (9% less), probably associated with low early plant populations. Table 3. Seed yield of soybean at five planting dates and four seeding depths, when averaged across two varieties (AG1832 and AG2431) in the 2013 and 2014 growing seasons. Seed yield also had a year x planting date x variety interaction (Fig. 1 and Fig.2). The Group II variety yielded the highest at the April planting date and June planting date in both years. The Group I and Group II varieties yielded the same on all three May planting dates. 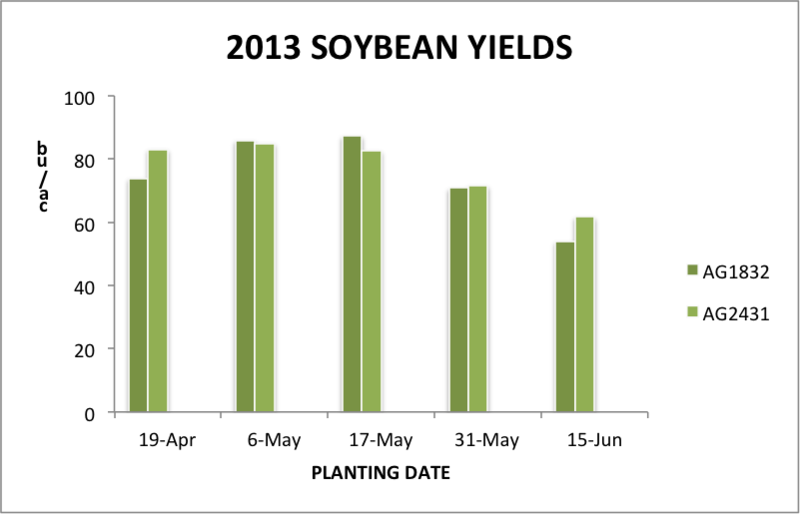 Yield showed a quadratic response to planting date in 2013 with lower yields at the April planting date, maximum yield observed between the May 6 and May 17 planting dates, and the lowest yield for the June 15 planting date (Table 3 and Fig.1). In 2014, yield showed a negative linear response to planting date with maximum yield observed at the April planting date, similar yields among the May planting dates, and the lowest yield for the June 11 planting date (Table 3 and Fig.2). 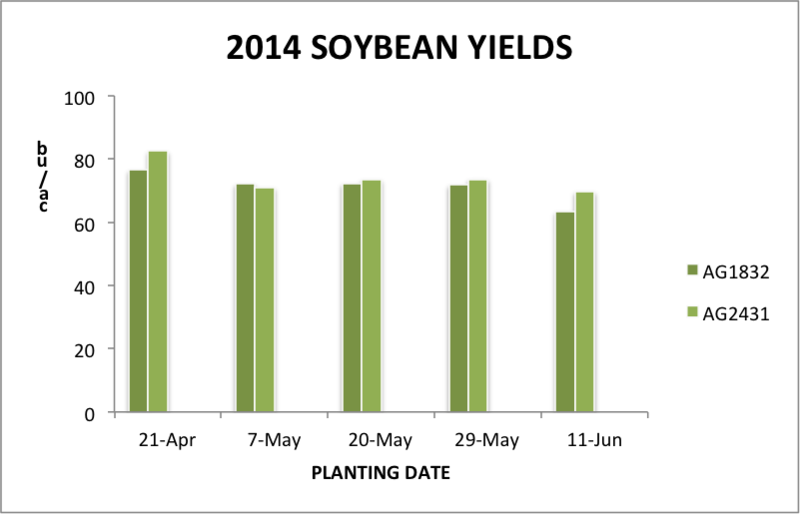 Soybean yields planted in late April compared to mid- June averaged ~30% higher in 2013 and ~20% higher in 2014. Fig. 1 Yield of a Group I (AG1832) and a Group II (AG2431) soybean variety, averaged across four seeding depths, at five planting dates in 2013. Fig. 2 Yield of a Group I (AG1832) and a Group II (AG2431) soybean variety, averaged across four seeding depths, at five planting dates in 2014. When averaged across years, varieties and planting dates, a negative linear relationship existed between early plant populations and seeding depth, indicating that the 1.0 inch seeding depth had the highest overall early plant populations (~133,000 plants/acre compared with ~123,750 plants/acre at the 2.5 inch depth). 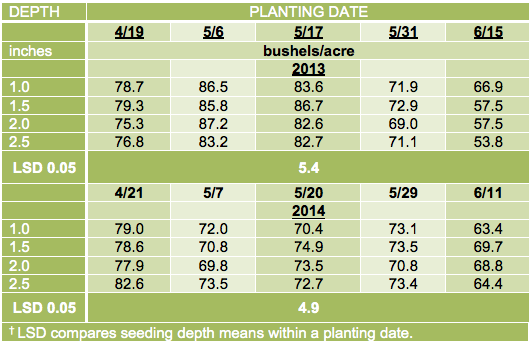 Nevertheless, the year x planting date x seeding depth interaction, in part because the 1.0 inch seeding depth had the lowest early plant populations compared to all seeding depths on the May 20 planting date in 2014, indicates that the 1.0 inch depth may result in poor early stand establishment when an extended dry period follows planting. Likewise, lower early plant populations at the 2.5 inch depth on the April and June planting dates, but similar early plant populations on the May planting dates, indicates that 2.5 inch depth is too deep under cool conditions, or if soil crusting occurs after planting before emergence. Consequently, the 1.5 to 2.0 inch depth range appears to be the optimum for early plant establishment for most planting dates. Plant populations, however, do not correlate with yield in most situations, unless final stands are less than ~114,000 plants /acre under NY growing conditions (Cox and Atkins, What’s Cropping Up, Vol.21, No.2, p. 5-6). Consequently, the relationship between yield and seeding depth was neither linear nor quadratic when averaged across years, varieties, and planting dates. Soybeans have a tremendous ability to compensate or fill in when early plant populations are low, which is reflected in similar yields among seeding depths, despite low plant populations at the 2.5 inch depth for the April planting dates in both years and for the 1.0 inch depth for the mid-May planting date in 2014.. Soybeans, however, did not compensate for the low plant populations at the June planting dates, as evidenced by lower yield at the 2.5 inch depth in 2013 (~20% less than the highest yield on that date) and at the 1.0 inch and 2.5 inch seeding depths in 2014 (8-9% lower than the highest yield on that date). Perhaps, soybeans have less time to compensate for lower plant populations if planted in mid-June in NY. When averaged across years, varieties, and seeding depths, yield showed a quadratic yield response to planting date with maximum yields occurring at the late April and early May planting dates. The year x variety by planting date interaction for yield indicated that a Group I or Group II variety planted in early or mid-May yielded highest in 2013 but a Group II variety planted in late April yielded highest in 2014. 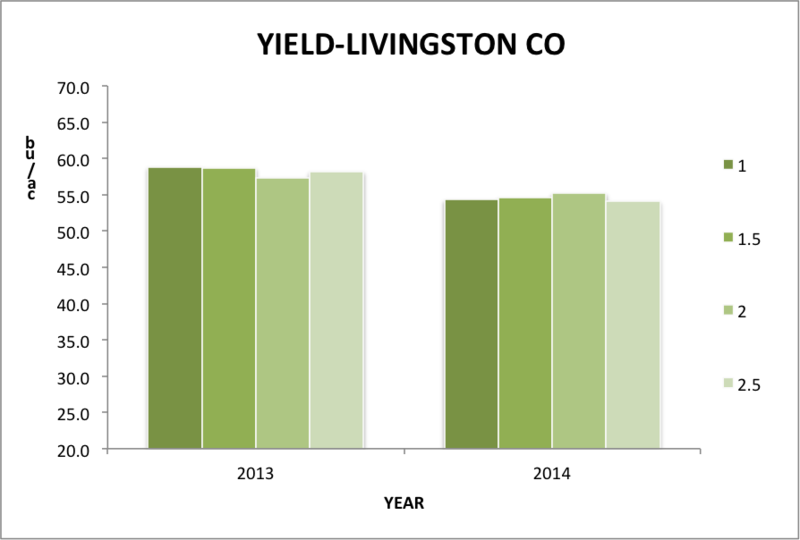 Yields decreased for both varieties at the late May planting date in 2013 but yields were the same across all May planting dates for both varieties in 2014. Yield of the Group II vs. Group I variety was higher for the June planting date in both years. The yield data indicate that a Group II variety planted sometime between April 25 and May 10 appears to be the optimum range compared to the general belief of the May 10 to May 25 range. Growers who have a corn-soybean-wheat rotation in some fields may wish to consider planting a Group II variety ahead of corn or simultaneously with corn in late April or early May in those fields, especially if timely planting of wheat is a concern. The 20-to 30% higher yields for late-April compared to mid-June planted soybeans may prompt growers who do not have wheat in their rotation to consider planting soybeans in late April or early May, simultaneous with corn planting. Keep in mind that this study was conducted on a well-drained soil in a region of the state where spring frosts do not typically occur after May 15. Late April-planted soybeans are not recommended for poorly drained soils or on farms where frost can occur after May 15. Correct soybean planting depth is considered essential for maximum soybean yields. Too shallow a seeding depth (<1.0 inch) may result in poor early stand establishment. Soybean must imibibe half of its weight in water before it germinates. Tilled soils may dry out in the top inch after planting, resulting in the initiation of the emergence process but not completion. Consequently, poor stand establishment can occur at a shallow planting depth because of seed desiccation under extended dry periods after planting. On the other hand, planting deeper than 2.0 inches may also result in poor stand establishment. The soybean hypocotyl, the plant part that breaks through the soil surface during soybean emergence, is somewhat fragile. Heavy rains after planting may result in soil crusting, resulting in hypocotyl damage and unsuccessful emergence, especially for deep-planted soybeans struggling to break through a thick soil crust. We conducted field-scale (5 to 10 acre) studies in 2013 and 2014 with growers in Cayuga, Livingston, and Tompkins County to evaluate early plant populations and yield of soybeans planted at 1.0, 1.5, 2.0, and 2.5 inch depths. Group II varieties were used at all sites but varieties differed as did planting dates (May 8 and May 24 at Cayuga Co.; May 27 and June 6 at Livingston Co.; and May 18 and June 2 at Tompkins Co. in 2013 and 2014, respectively), and seeding rates (~140,000 seeds/acre at Cayuga and Livingston Co. and ~175,000 seeds/acre at Tompkins Co.). Silt loam soils predominated at the Cayuga Co. site, clay loam soils at the Livingston Co. site, and gravelly loam soils at the Tompkins Co. The Cayuga Co. site (30-inch rows) was no-tilled, and the Livingston and Tompkins Co. sites (15-inch rows) were chisel-tilled. Corn was the preceding crop at all sites. Negative linear responses of plant populations to seeding depths were observed at Livingston and Tompkins Co. sites in both years, indicating a decrease in early plant populations as seeding depth increased from 1.0 to 2.5 inches (Table 1). In contrast, seeding depth did not affect early soybean plant populations at the Cayuga Co. site in 2013, and showed a positive quadratic response to seeding depth in 2014 (no significant increase in early plant populations beyond the 1.5 inch depth). It is not clear if soil type (silt loam soil), row spacing (30-inch rows), land preparation (no-till), or planting date (earliest planting date among three locations in both years) influenced the different response at the Cayuga Co. site, or if the response was unique to this particular farm. Visual observation during plant population estimates in 2014, however, indicated poor penetration of the planter unit in one of the rows at the 1.0 inch depth, resulting in low plant populations in that row, suggesting that the response was unique to this farm in Cayuga Co.
Table 1. Plant populations of soybean at ~1st trifoliate leaf stage (~V2) at three locations and four seeding depths in the 2013 and 2014 growing seasons. Early plant populations at all sites in both years exceeded ~114,000 plants/acre, except at the 2.5 inch depth at Livingston Co. in 2013, the threshold below which soybeans yields decreased in previous studies in NY (Cox and Atkins, What’s Cropping Up, Vol.21, No.2, p. 5-6). Consequently, it was not clear until harvest if plant population decreases with deeper seeding depths were of sufficient magnitude to result in yield differences. Soybean yields at the Cayuga Co. site showed a positive quadratic response to seeding depth with maximum yield occurring at the 1.0 depth in 2013, despite no differences in early plant populations (Fig.1). In 2014, the 1.5 inch depth yielded the greatest (least at the 1.0 depth with early plant populations of ~111,000 plants/acre) , similar to the early plant population response (Fig.1). Despite negative linear responses of early plant populations to seeding depth at the Livingston Co. site, yields did not respond to seeding depth in either year of the study (Fig.2). Evidently, early plant populations of ~112,000 plants/acre in 2013 was sufficient to attain maximum soybean yield at this site. 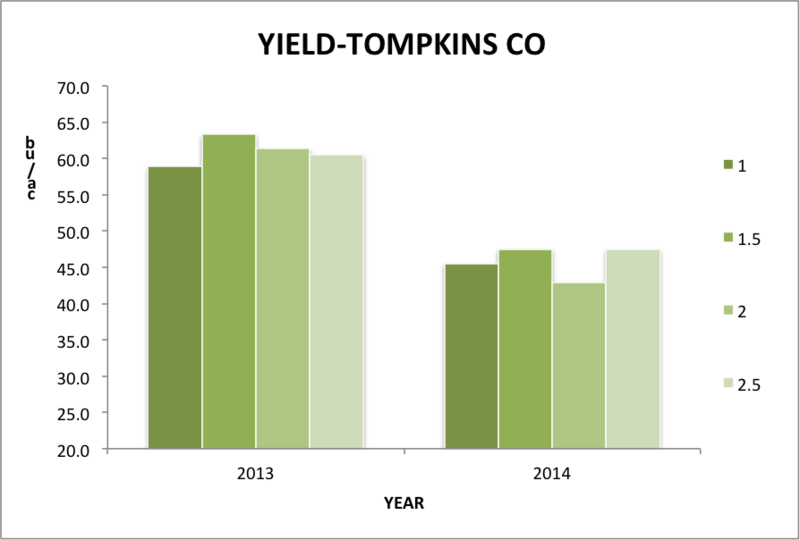 Soybean yields showed a positive quadratic response to seeding depth at the Tompkins C. site in 2013 with maximum yields occurring at the 1.5 inch depth, but yield did not respond to seeding depth in 2014 (Fig.3). It is not clear why the early plant population response to seeding depth was consistent across years, but the yield response to seeding depth was inconsistent across years at this location. 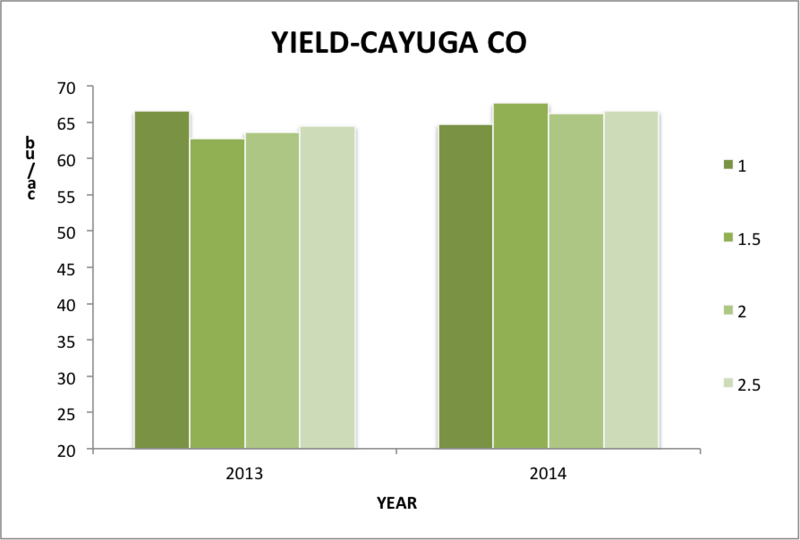 Fig.1 Soybean yield at a Cayuga Co. farm at 1.0, 1.5, 2.0, and 2.5 inch seeding depths in 2013 and 2014. Fig.2 Soybean yield at a Livingston Co. farm at 1.0, 1.5, 2.0, and 2.5 inch seeding depths in 2013 and 2014. Fig.3 Soybean yield at a Tompkins Co. farm at 1.0, 1.5, 2.0, and 2.5 inch seeding depths in 2013 and 2014. Late May and early June conditions were generally wet and warm at all locations in both years so weather conditions were not conducive to drying of the seed at the 1.0 inch seeding depth, nor soil crust development and subsequent hypocotyl damage to deep-planted soybeans. Consequently, soil and weather conditions were close to ideal for soybean emergence. Nevertheless, deeper seeding depths (2.0 to 2.5 inch range) consistently decreased early plant populations at two sites in both years, indicating that deeper planted soybeans, especially beyond the 1.5 inch depth, can result in poorer stand establishment even under ideal emergence conditions. At the third site, however, where soybeans were no-tilled in 30-inch rows, seeding depth had minimum effect on early plant populations, except at the 1.0 inch depth in 2014, when one planter unit had trouble penetrating the soil. It is not clear if 30-inch row spacing (~8 seeds/foot of row combining to break through the soil compared to 4-5 seeds/foot of row in 15-inch rows) allowed for better emergence from the deeper seeding depths at this location. Yield did not respond to seeding depth in 3 site/years and showed quadratic responses in 3 site/years. Yield differences, however, were generally small at responsive sites with only 4.5 to 6.0% differences between the highest and lowest yields at the 30-inch row, no-tilled site, and 7.0% at the gravelly loam site. Despite the somewhat muted yield responses in this study, in part because of ideal conditions for emergence (>72% for all seeding depths at all sites in both years), soybean growers should be mindful that the 1.0 inch seeding depth can be too shallow in some instances (Cayuga Co. in 2014) and the 2.5 inch seeding depth can be too deep in some instances (Tompkins Co. site in 2013). The 1.5 inch seeding depth generally resulted in excellent early stand establishment (>85% emergence for all site/years except for 77% at Tompkins Co. site in 2013) and maximum yield in two of the three instances where yields responded to seeding depth. Growers should probably strive to be ~1.5-2.0 inch seeding depth range to avoid potential desiccation of the seed at depths < 1.5 inch and potential soil crusting problems at depths >2.0 inches. 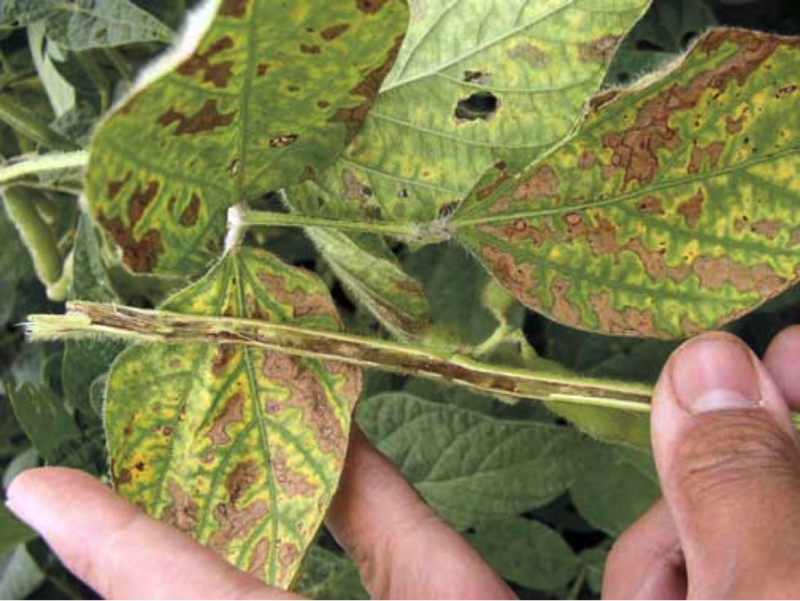 A potentially yield-reducing disease called ‘brown stem rot’ (BSR) was confirmed for the first time in New York soybean fields in 2013, and was found again in 2014. It showed up in some plants from soybean fields in Cayuga, Herkimer, Niagara, and Yates Counties collected by Cornell Cooperative Extension Educators Kevin Ganoe, Keith Severson, Michael Stanyard, and Bill Verbeten, with support from the New York Soybean Check-off Program. The disease was diagnosed in the Field Crops Pathology Laboratory at Cornell based on characteristic symptoms and the laboratory isolation of the causal fungus and confirmation of a portion of its signature DNA sequence. So far, BSR has not been detected outside of the four counties mentioned above. It is noteworthy that BSR was not detected in soybean fields in northern New York scouted in 2013 and 2014 by CCE Educators Michael Hunter and Kitty O’Neil, with support from the Northern New York Agricultural Development Program. Brown stem rot is caused by the fungus Cadophora gregata (syn. Phialophora gregata) and occurs in most soybean production regions of the US, but this is, to our knowledge, the first confirmation in New York or the northeastern U.S. Reported yield losses in the Midwest have ranged from minor to in excess of 25%, so the presence of the pathogen is considered a significant factor for soybean production. Yield loss is often a function of the relative susceptibility of varieties that are planted; varieties vary from susceptible to resistant. BSR is a disease of priority to soybean seed companies. Resistant varieties are widely available, and most seed catalogs provide resistance ratings for BSR. If BSR becomes more prevalent in New York, selection of resistant varieties may become more important for New York producers. The foliar symptoms of BSR are similar to those of other soilborne diseases that restrict the movement of water and nutrients to the leaves. So BSR can be confused with northern stem canker and sudden death syndrome, all of which result first in yellowing and then browning of leaf tissues between the veins during pod-filling stages. However, not all soybean varieties exhibit foliar symptoms when infected with the BSR fungus. What is distinctive about BSR is the browning of the internal tissues of infected plants (Figure 1). This discoloration is often most obvious near the nodes when stems are split lengthwise. Dead leaves may remain attached to the plant. Stem discoloration symptoms may be confused with those caused by white mold, northern stem canker, or Phytophthora stem rot. Infection by the fungus occurs early in the season, through the roots, from where the fungus continues to grow throughout the plant’s water-conducting tissues. Temperature has the greatest impact on disease development, and is favored by temperatures between 60 – 80F. But, temperatures above 80F may halt BSR development and spread. Because infection occurs at early stages (around the three leaf stage) of the crop, foliar fungicides applied during flowering and pod-filling stages will not be effective in suppressing BSR. The fungus survives on soy residues and in the soil in the field for many years. Luckily, the pathogen survives on few other plant species, and in severely infested fields, a rotation of at least 3 years out of soybean and deep plowing of infected soybean residues would reduce the incidence of BSR in a subsequent soybean crop. The most important thing that a New York soybean producer can do at this time is to learn to recognize the symptoms of BSR and other soilborne diseases and to get a diagnosis of problems that they observe in their fields. If BSR or other soilborne diseases are confirmed, producers should talk to their seed supplier and order soybean varieties with appropriate levels of resistance for the soilborne diseases observed on their farm.